The range of services that Vanoncini Pietro & C snc has developed over the course of about 30 years, offer to the client a 360° service. The client can trust at all times on a competent team, ready to support and guide them in understanding the various methods and the different meanings “to live today”, development a relationship of trust with its clients. The company has a strong interest for 20′ century furniture and art ; that is why we carefully selects and offers our customers highly representative design furnitures and artworks. 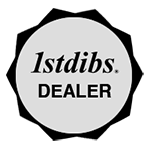 At 1stdibs, our mission is to deliver our selected collection of unique furnitures to customers around the world. 1stdibs brings together the most prestigious international dealers of antiques, vintage furniture and design, fine art, estate jewelry, vintage couture and fine homes, granting our customers instant access to luxury goods of the highest quality. In 2001 Michael Bruno, 1stdibs founder, discover the historic Paris Marché aux Puces and found items of such beauty and authenticity, he was moved to purchase several for his own collection. Bruno couldn’t keep this discovery to himself. He created the website 1stdibs.com as a vehicle for sharing his find with the world. In just over a decade, 1stdibs has grown quickly to become the premier online luxury marketplace. It’s a testament to the quality of items and services made available and the enduring reputation of the dealers featured on our site. We are happy to be one of the prestigious dealers selected by 1stdibs.